Doha doesn't have oodles of greenery and trees (obviously), but there are lots of palm trees around. Pretty much everywhere in the city. These palm trees look inconspicuous enough (although not like the ones in Texas, for sure) so I didn't really pay much attention to them... until recently. For the last month or so, I have noticed that many of these palm trees started having bunches and bunches of oval ball things hanging from them - like big bunches of grapes. I called them 'coconut ball bunches' for lack of a better phrase (they actually don't look like coconuts at all, but they are in about the same place). These oval balls started catching my attention when I noticed that locals were placing mesh bags around many of the bunches up in the trees. Being the smarty pants that I am, I assume (to myself ) that the local conscientious gardeners must do this to prevent them from falling all over lawns and streets & making a mess. Makes sense right? Right. Then Cooper and Bentley start taking an unnatural interest in the coconut balls on the ground. They pull and tug at their leashes whenever they see them scattered on the ground (which is often as we have many in our front lawn). Then - they eat them. Devour them really. They gobble them up like they are the tastiest things they have ever experienced in their furry little lives. So, I am thinking my dogs are pretty strange. And, really, neither of them has a great track record of having superior taste preferences (Bentley's dish of choice would be bird poop and dried worms, while Cooper rathers fresh baby spit up), so I assume this is just a new weird little habit. But, then their craziness gets more and more intense as the days go by and the coconut balls start turning color from a yellowish green to a dried up purple. Hmmm. My wheels start turning again, and I decide I have to look into this further. So I google it. OMG! I am so stunned sometimes, I swear. Dates! 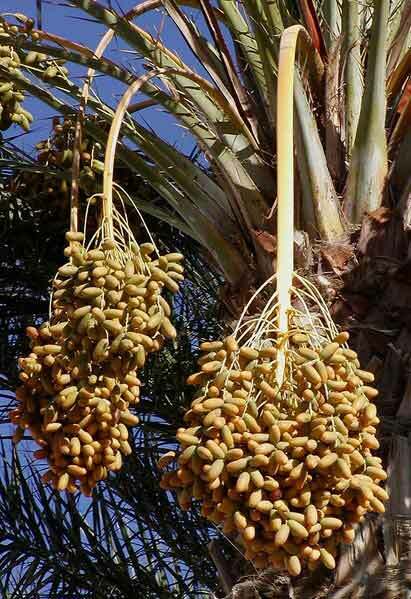 Date Palms! Actually, Phoenix Dectylifera. Of course. I live in the land of dates... they even sell them at kiosks in the malls. DATES. My lightbulb was burning brightly now as the pieces fell into place. My dogs love dates.